We had some roasted and ground hazelnuts lying around from a hazelnut loaf we made with the breadmaker. By "lying around", I do mean they were just in a bowl on the counter, getting moved around as space was needed. Am I being overly dramatic if I say that the idea for this came to me in a dream? 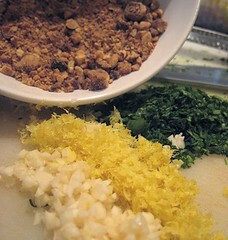 I simply added ground hazelnuts to a standard gremolata. I finished it with a tiny sprinkle of salt. 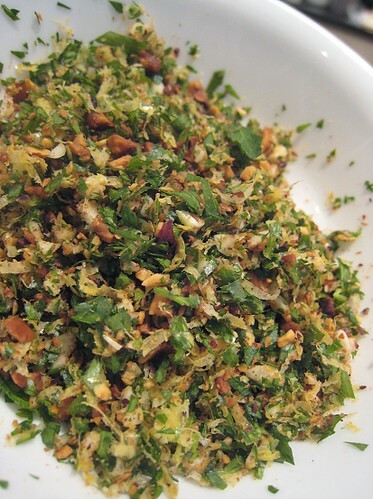 I actually made this hazelnut gremolata to go with another dish (Duck Stock Risotto with Portobello & Swiss Chard). Good thing there were some leftover, as this was superb on our Portuguese meal. If you'd like to participate, see who's hosting next week. WHB is hosted this week by Cheryl of Gluten Free Goodness. This sounds really good with the pork you made! I know this has to be delicious...I thinking over a piece of fish, or on a piece of toast, or...well, I could go on and on. What a great idea and it sounds like it has a wonderful citrus, nutty flavor! really great adding the hazelnuts. gotta say, portugal is on our "to-go-to" list, so we can't wait to hear about your travels. It was very nice; all bright, zesty, and crunchy like that. Hehe. Lots of ideas is good. Too bad it's only "virtually." Looks so good. Thanks for sharing. I didnt even think about fish -- but oh, yes!